DHAKA, Bangladesh -- Anxiety has yet to die down over a week after crowds of Muslims torched more than a dozen temples and scores of houses in southeast Bangladesh, leaving thousands of Buddhists with the unshakeable premonition that more violence was forthcoming. The government has repeatedly tried to assure the religious minority that they have the support and protection of the state, while the chairman of the National Human Rights Commission, Mizanur Rahman, apologised for the atrocities – but it seems nothing can assuage the fear of fresh violence. “We’re shocked by this unexpected violence… yet we appeal to all to maintain peace as Buddhism preaches peace and non-violence,” Dr. Pranab Kumar Baruya, a former visiting professor of Dhaka University, told IPS during an interview at the Dharma Rajika Buddhist Monastery in Dhaka. “We want communal harmony. We number only one million (in Bangladesh) and we need the support of the government and the majority of the people in a country where we’ve also been born and where Buddhism has been practiced for more than a thousand years,” he added. Amid mounting pressure on the government to launch a judicial inquiry into the attacks, the country’s top business leaders have expressed anxieties that a recurrence of such incidents might have a negative impact on the country’s image, investment and international trade. “A sense of fear still persists among the Buddhist people and it’s the responsibility of the government to allay the fear by providing proper security and bringing the culprits to justice,” Ranjit Kumar Barua, a retired joint-secretary to the government of Bangladesh, told IPS. The riot began on Sept. 29, when large crowds of Muslims attacked Buddhist shrines and torched homes in southeast Bangladesh, home to the highest concentration of Buddhists in the country. Protesters chanted anti-Buddhist slogans and rioted throughout the night in the town of Ramu in the tourist district of Cox’s Bazar. Violence spilled into the adjoining areas and continued the following day. The local administration had to call in the army, paramilitary troops from Border Guards Bangladesh and police forces to maintain law and order. According to Baruya, ancient Buddhist relics, along with rare palm-leaf manuscripts of folk and religious tales (locally known as Puthis) were burned and several hundred rare statues of Lord Buddha were either damaged or looted by the mobs. “Almost all the temples and monasteries, adorned intricately with wood carvings, were burned and damaged. They were several hundred years old; some of them were built in the late 17th or early 18th centuries,” he said. “The temples belonged to the Buddhists, but they were also priceless treasures of our country (as a whole), they were part of our heritage,” Nehal Ahmed, a college professor in Dhaka, told IPS. Police and witnesses told IPS that a photograph of a partially burned Quran, allegedly posted on Facebook by a Buddhist youth, sparked the riot. An initial report said that the boy was tagged in the photo but did not post it himself. The Facebook user’s account has since been deleted. “This can’t be accepted in this relatively peaceful South Asian nation,” Ahmed said, referring to the recent deadly violence that swept across several countries in response to a low-budget American film, ‘Innocence of Muslim’, desecrating Prophet Mohammad. “We’ve seen many deaths during protests in Pakistan over the anti-Islam film, but it was relatively peaceful in Bangladesh,” he said. Top political leaders, hailing from the ruling Awami League and the opposition Bangladesh Nationalist Party (BNP), have pointed accusing fingers at each other in a blame game that has further deepened the anxiety of Buddhists who comprise less than one percent of the total population in Muslim-majority Bangladesh. Bangladesh Home Minister, Mohiuddin Khan Alamgir, who visited the scene of the violence immediately after the riot, blamed the BNP for the attacks. The minister said the violence was planned, citing evidence of gunpowder and petrol found in the burnt monasteries and houses. Both the prime minister and the home minister also hinted that Rohingya Muslims, refugees of persection and sectarian violence in neighbouring Myanmar (formerly Burma) who fled to Cox’s Bazar two decades ago, might be responsible for instigating the attacks. Meanwhile, Khaleda Zia, leader of the BNP and a former prime minister of Bangladesh, said on Saturday that the government itself was behind the attacks. 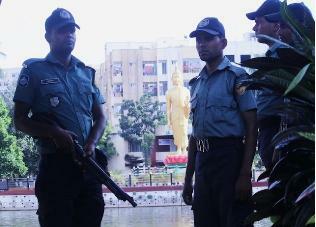 This week the Bangladesh Supreme Court ordered the government to ensure complete security to Buddhists and other minority groups. Buddhist monks, primarily in Myanmar, Thailand, and Sri Lanka, staged demonstrations in front of the Bangladesh missions in their respective countries, venting their anger and demanding an impartial probe into the attacks. International rights groups and non-governmental organisations including Amnesty International also asked the government to bring the culprits to book immediately. Many Buddhists feel that whatever the investigation unearths, horrific memories of one of the worst attacks on the Buddhist faith will remain alive.